Unique. Stylish. Luxurious. 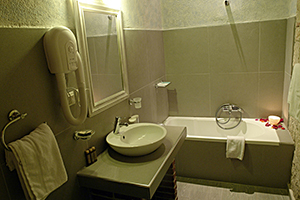 Petrino Suites Hotel is a four star hotel, environmentally friendly with… a “natural” advantage. 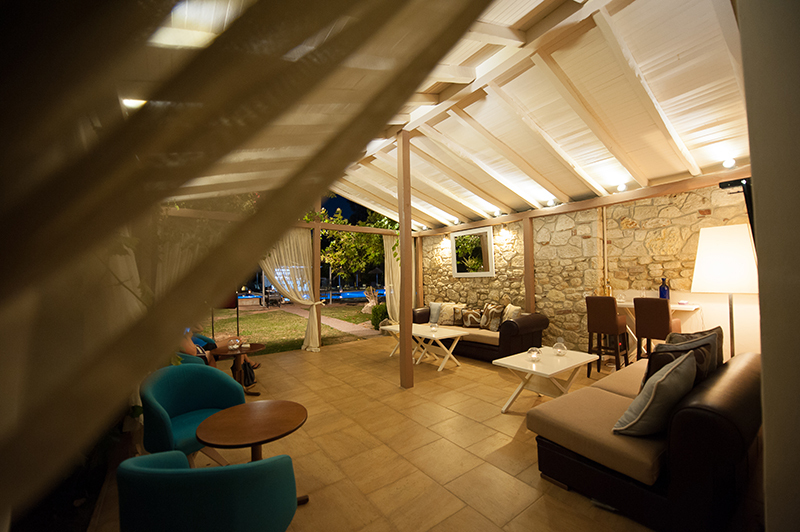 It is located in Afitos, Halkidiki just 500 meters away from the town center. It is a summer holiday resort in the beautiful peninsula of Kassandra, with an organized and quiet private beach, the sandy Moudounou beach and a beautiful view of the eternal mountain of the gods, the highest of the Greek mountains, Mount Olympus. Fully renovated in 2014 has been transformed into a high aesthetic boutique hotel. It is built with traditional architecture of wood and stone and is perfect for families. 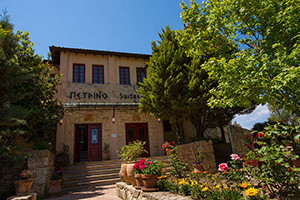 The hotel make an impression from the first moment as it is surrounded by magnificent organic gardens with olive trees, fruit trees, roses and paved paths that makes you feel you are in a small picturesque village. Our garden is an ideal choice to read, paint, or just relax in the shade of the trees during the hot days of summer, living unique moments of tranquility. 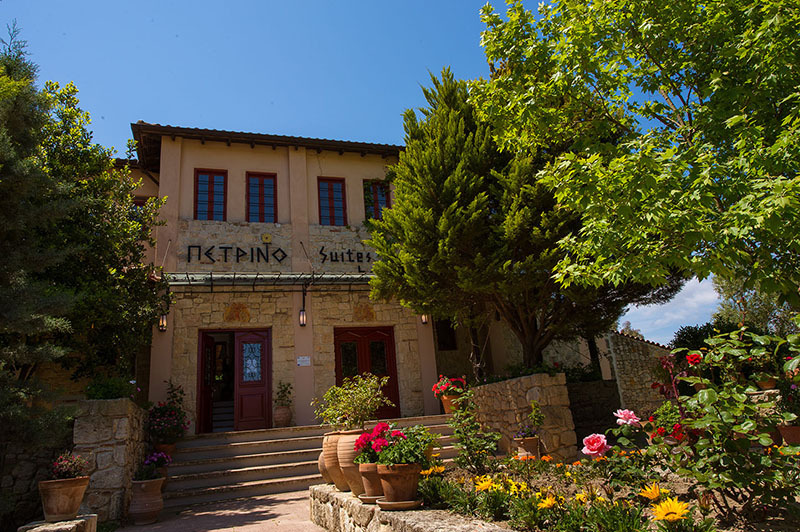 Hotel with a modern style, Petrino Suites Hotel, offers you an elegant accommodation with stylish furnishings and modern décor, fine antiques and warm colors. The highly aesthetic hotel, consist suites and villas with different decoration depending on the type of room that can satisfy a great variety of tastes. It is environmentally friendly and attracts visitors with ecological sensitivity. When it comes to gastronomy, Petrino Hotel has a learning class of culinary art with a seven day seminars for stakeholders. Fully synchronized with the modern trends of healthy nutrition offers a delicious Greek breakfast with traditional dishes made from organic products. Ιt also has an American type breakfast while the menu is daily enriched with new “surprise” flavors for our guests. Beside breakfast, you can enjoy a delicious lunch or dinner at the a la carte award-winning, ISO certified Petrino restaurant. 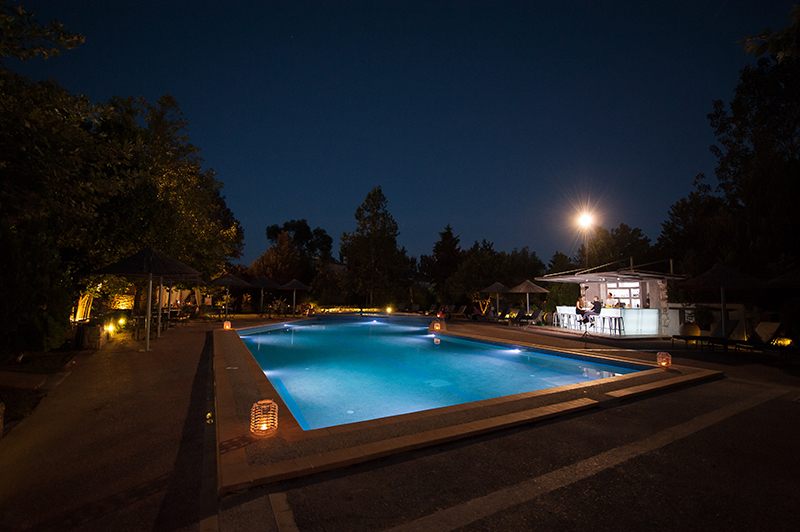 A main attraction for the visitors is the large outdoor pool with the astonishing pool bar. The garden along with the playground and pool, offers a nonstop but safe game for young guests. A library, a dvd club and a art gallery complete the set of the hotel's facilities. Take advantage of the special offers that run all year long and enjoy unforgettable four star holidays in incomparable Halkidiki. Welcome! Modern services, up to date facilities and high quality custom care, make the triptych of hospitality at Petrino Suites Hotel, one of the best hotels in Kassandra, Halkidiki. Its philosophy is summed up in one phrase: "Make yourself at home". Wireless (wi- fi) internet access is available in public areas and in rooms only on demand, reducing the electronic cloud for guests and ensuring the "detox" from the constant “waves” of information and images of the modern way life. Standard rooms at Petrino Suites Hotel are bungalows. They have a double bed, are decorated with the highest aesthetic standards and equipped with the most recent amenities. 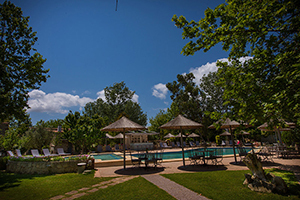 They also offer great view of the pool and the hotel's lush gardens and can accommodate up to 2 people. 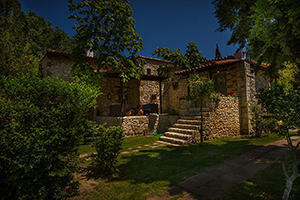 Two-storey house in Petrino Suites Hotel with a living room and fireplace. A wooden stairway leads upstairs, where the master bedroom is. 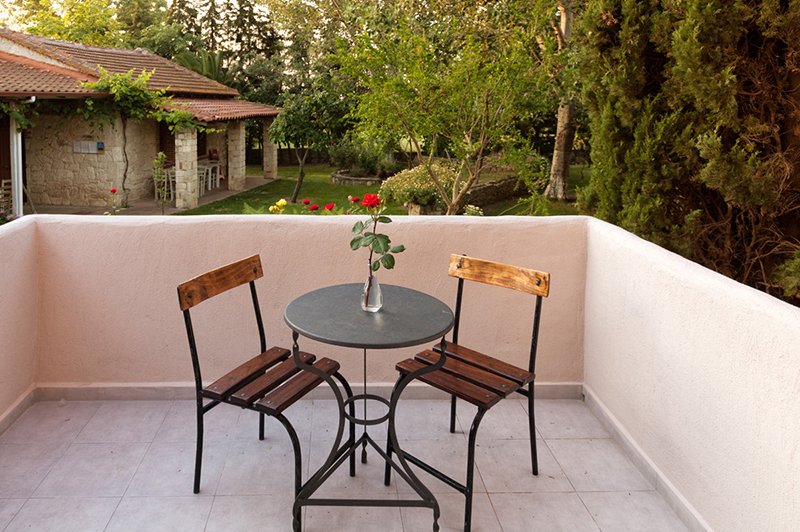 All junior suites offer splendid view of the hotel’s blossoming gardens and can accommodate up to 2 people. Two-storey house in Petrino Suites Hotel with a living room and fireplace. The living room sofa converts to a double bed. From the living room there is a wooden staircase that leads upstairs where there is the master bedroom. All Superior family houses offer wonderful views of the lush gardens of the hotel and can accommodate up to 4 guests (3 adults and 1 child or 2 adults and 2 children under 12 years). Two-storey house in Petrino Suites Hotel with living room and fireplace. The living room area has a couch that converts to a double bed. In the living room there is a wooden staircase leads upstairs where you will find the main bedroom. It can accommodate 4 guests (4 adults or 2 adults and 2 children). 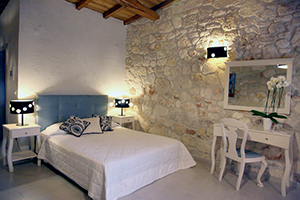 Two-storey house in Petrino Suites Hotel with 2 bedrooms and living room with fireplace. It has a bedroom and a living room with sofa that converts to a double bed. In living room there is a wooden staircase leads to the upper floor where the master bedroom is. All deluxe Maisonettes offer wonderful view of the lush gardens of the hotel and can accommodate up to 6 guests (4 adults and 2 child or 2 adults and 4 children). Junior Suites at Petrino Suites Hotel are decorated in a modern style. There are on the ground floor face to our gardens. It is a combination of a bedroom and a small sitting area. Two-storey maisonettes at Petrino Suites Hotel is the ideal choice for honeymooners and even more. They have a private pool for an unforgettable summer experience with privacy and tranquility. They also have a living room with a sofa that converts to a double bed. In the living room there is a wooden staircase leads to the upper floor where the master bedroom is. 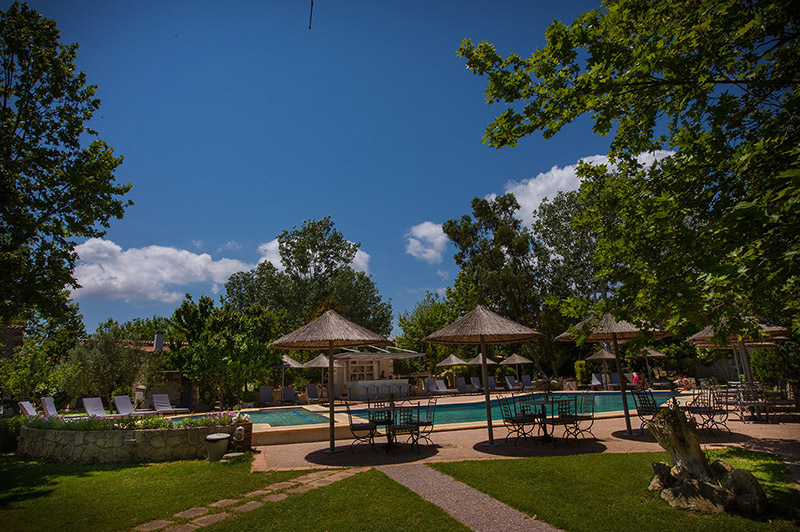 All Suites with private pool have a beautiful view of the gardens of the hotel and can accommodate up to 4 guests (3 adults and 1 child or 2 adults and 2 children under 12 years). Family Appartment in Petrino Suites Hotel, consisting of two double rooms connected by an internal door and converted into a spacious and comfortable family room. 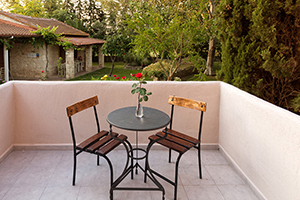 They are decorated with bright colors and fabrics and offer wonderful views over the hotel's green gardens. They can accommodate up to 4 guests (up to 2 adults and 2 children).